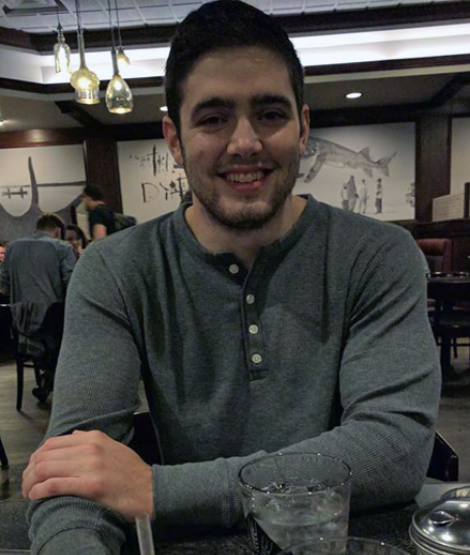 Brady Cable is a Coach and Operations Manager at Kabuki Strength. His personal best deadlift is 765lbs in the 93 kilo weight class. And yes, pulled with a hook grip. 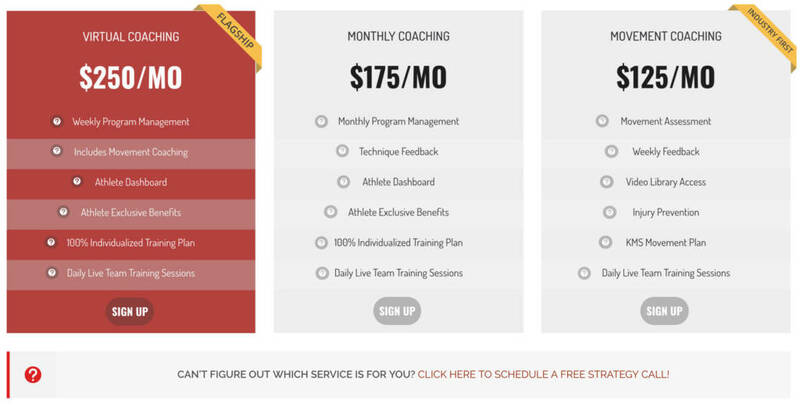 If you are interested in working with our coaches, please visit our coaching site. Grip in the deadlift is an issue that not everyone has a problem with. Something that those who do struggle with grip loss know it to be all too frustrating. Someone once said to me “if you haven’t had a grip problem, you might just not be strong enough to have a grip problem yet”. People who often use straps for much of their training find their grip might become the limiting factor in their competition deadlift over other parts of their body. One of the most disappointing things in powerlifting is locking out a big PR deadlift, especially on the platform, and then dropping it near or at lockout. Knowing your body had all the strength required to lift the weight, but your hands did not. Between this and a growing fear or possibly awareness of the possibility of bicep tears, using a double overhand hook grip is something that’s becoming increasingly popular within the sport. I don’t think hook grip is the only solution to grip problems, or even a solution at all for some people. 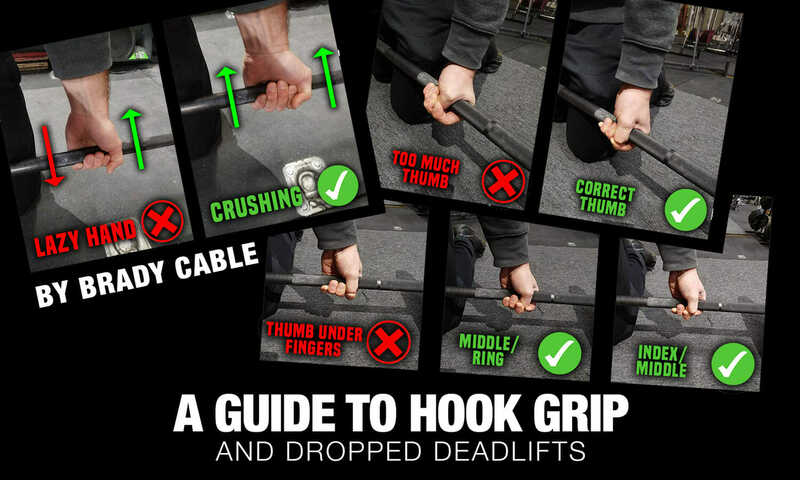 This article will be a comprehensive guide to learning and working up to using hook grip but will also be riddled with general grip advice that will be applicable to any style and may just make you a better at the deadlift. The order matters on these, and I usually check them off in that sequence. This list is organized two ways; both by how much time it takes to improve the attribute and how common it is for people to have the issue. Intent may be tied with technique issues for being the most common fault, but this is the easiest and quickest thing to check and be able to affect change in. I see a lot of people with grip issues just lazily holding the bar, or only trying to hold it with a few of their fingers. It’s important to focus on crushing the bar with your whole hand, all the way out to your pinkie. There are two reasons for this; one because it’s going to help you hold on to the bar, but you’re also going to get better activation or neural drive to the upstream musculature all the way up to increasing trunk stiffness (this is the part that might make you a better at the deadlift in general). On the opposite end of the spectrum from people not trying hard to hold on to the bar, the other common issue I see with individuals who’ve had grip issues previously is that they try to work the bar up extremely high into their hand. Placing the bar too high up in the hand piles it up behind the callouses and looser skin at the base of your fingers, and if the bar starts to slide it has a high likelihood of sliding and taking those callouses or skin with it. Having the bar worked up high gives it more room to slide down, which is where you’ll really tear your hands or drop deadlifts. You want to start the bar in the position that’s easiest to squeeze and keep the bar from moving at all. Where this is will vary from person to person based on hand size. Bar position in hand becomes increasingly important with hook grip as the bar moving is not only likely to tear your thumb, but extremely likely to pull your thumb out of the hook position and open your hands up. With a hook grip you’ll be able to hold the bar lower than a mixed grip and I think this is one of the reasons it’s advantageous to the mechanics of the pull. You get not only the symmetry of pulling with both hands in the same position, but also get to lower the bar slightly and start in a slightly higher position. These details are all minimal but especially when you start incorporating things like a deadlift bar when the weights get heavy, it all adds up. 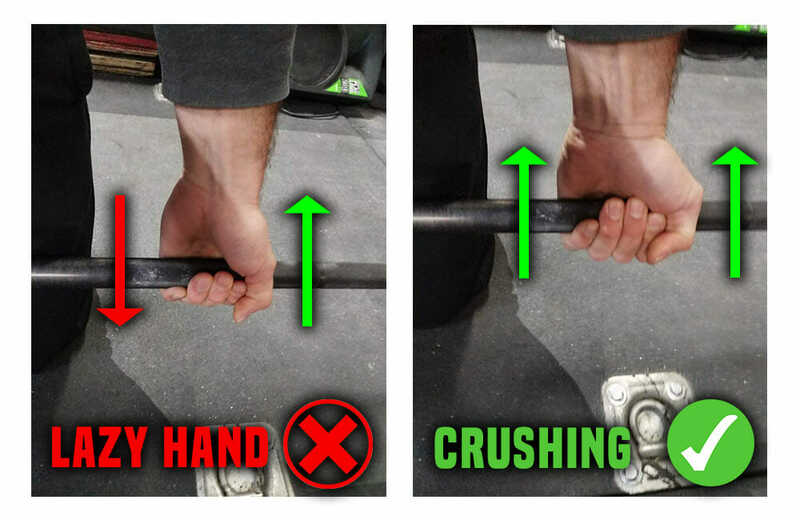 The other aspect of a hook grip that makes it more important to not hold the bar so high is that when you place your thumb between the bar and the insides of your fingers, your thumb is creating a space between your fingers and the bar. 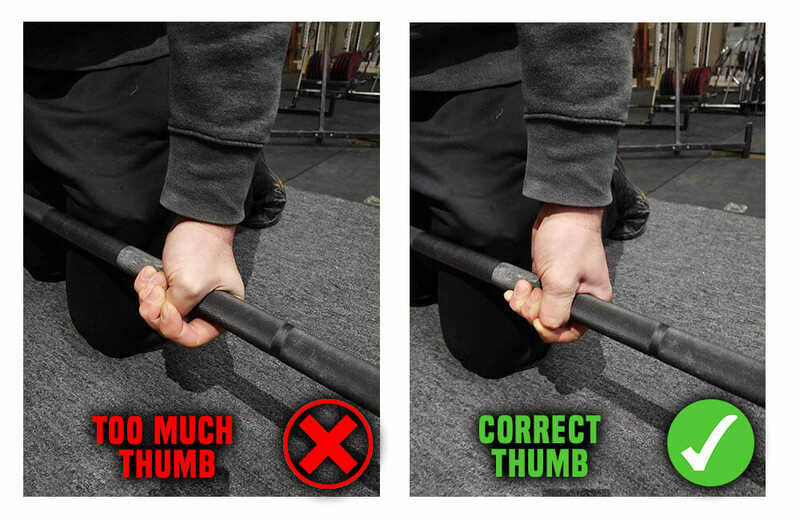 The more of your thumb you jam in there, the bigger that space will be, the more your thumb will hurt, and the harder it will be to hold the bar. This is easily the most common error I see with people new to hook grip is that they think putting more of their thumb in contact with the bar will lead to stronger grip. This is also often what leads to the extreme pain associated with a hook grip and to people then abandoning it early on. What you do want to do is use your thumb like a lock. There isn’t one single way to hook grip, but there are some principles to start with. First off, you want as little of your thumb in as possible while still maintaining a strong grip. Second, you want the thumb (especially the nail) to be between your fingers, not underneath them. You want your thumb between either your index and middle finger, or middle and ring finger depending on what works best for you. The last small technique piece I’ll touch on is patience. You want to make sure you’re setting your hook grip in the same way every time and not rushing setting your hands before the pull. Especially as you develop your technique and start to find what works well for you, you want repeatability within that technique. Tying all this back to intent, you need to make sure after your grip is set that you’re still squeezing the bar. It will be easier with a hook grip to let the bar sit in your first few fingers but keep pressure on with your entire hand. Lastly, the thing that takes the most time to affect change is the strength of your grip. I say the most time, but that’s compared to changing how hard someone is trying or changing their technique. Grip is something that is specific and with training will come up fast. If it’s an issue, it’s something you need to be diligent about working on, but it’s something that will improve quickly. The thing I’ve seen the most success with for training grip is simply doing holds at the end of a day of deadlift sets (whether it’s a single rep on its own, or the last rep of a last set of a day). The biggest consideration with training grip is doing it in such a way that it doesn’t affect your ability to do your sport specific deadlift training (so not doing a lot of it before your deadlift training). Grip can be trained often and hard, but you also want to consider what you’re trying to improve. For powerlifting, you’re ultimately training to hold onto as heavy of a weight as possible for a single rep. It won’t be a fruitful approach to work grip endurance in parameters well outside of your sport (think 2-minute holds on a pullup bar). Train your grip hard but for short duration and in high frequency. Getting back to talking specifically about hook grip, one of the most commonly asked questions I get is how long it takes to feel normal. The longer answer is, it takes time. You can’t just jump in with a new grip and expect to do all your same working weights immediately with a hook grip the first day you try it. You need to start slow and do what you’re able to. Your body will adapt and become more comfortable handling more and more work in that position over the coming weeks. The short answer is graduated exposure, so I’ll lay out some examples of what that looks like. This isn’t the end all be all guide to progressing to using hook grip, just an example. You will need to push yourself to a pace of using it that will be uncomfortable, but also give yourself time to adapt, and this is going to be different for each person. This progression might be done at half the pace for some and twice the pace for others, it will be entirely dependent on what you’re able to handle. There are a litany of grip exercises you can do from plate pinches to farmers walks, but before you go doing a laundry list of new exercises and additive things, it’s worth examining your training to see if there’s room to improve within your current structure. If you’re only deadlifting once a week and you’re using straps for every session, you’re never training your grip specific to the deadlift. Any amount of extra stimulus is going to begin improving your strength. If you’re deadlifting once a week not using straps and doing RDLs on another day with straps, you can experiment with not using straps for your first set of the RDLs, or only using them for the second half of the set(s). Training grip is just like training anything else. Doing more work than you were previously, especially in a specific context is highly likely to lead to improvement. If you’re always using straps for everything and you have grip problems, stop doing that first and give yourself time for graduated exposure. Try hard, fix your technique, and get stronger. Kabuki.MS is our subscription movement library containing hundreds of videos on human movement, train preparation, technique, cueing, and other topics. Use the code below to register and get your first month’s subscription on us!